What’s Free in London is perfect for those who truly are broke. It has gathered all the best things to do in London for absolutely squat. That’s right, free! So whether you’re on a visit to the capital or a local looking for some fun days out, then look no further as all the best attractions and sightseeing locations are listed in one place. What’s Free in London has all the information you need on how to get there and make the most of your day, even with empty pockets. Unfortunately, the only downside is the slightly amateur feel to the website. Have details on Festivals, Events, Museums, Galleries, Lectures, Guided Walks, Churches, Tours, Cemeteries and Landmarks throughout London, all for free! Some events listed are on offer and are only free for a certain amount of time, make sure you’ve got the right date! What’s Free in London is perfect for those who’ve got nothing in their pocket but who still want a great day out in the capital. With heaps of different events to choose from, there’s no doubt you won’t find something to Enjoy. 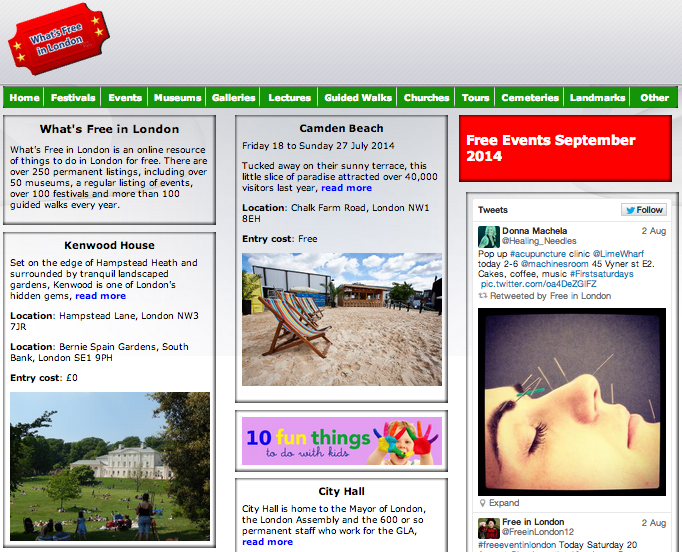 Check out our Events and Gigs section to find loads more free things to do in London.